Today’s topics: Kevin Wells discusses his book Burst. 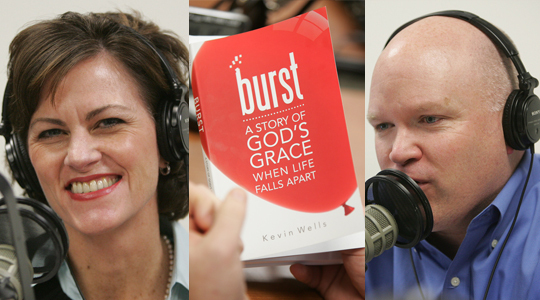 Summary of today’s show: Scot, Jen Schiller, and Kevin Wells discuss Kevin’s moving book Burst: A Story of God’s Grace when Life Falls Apart, in which Kevin details how his faith helped him through various medical and family traumas. 1st segment: Scot opened the show by wishing all the listeners a happy feast of Our Lady of Guadalupe today, and thanked WQOM for a great conference this past Saturday at the Lowell Memorial Auditorium. Scot welcomed Jen to the show. Jen said she got Kevin’s book from friends several months ago. She explained that she knew Kevin from Loyola University, and was very excited to read Burst. Jen said the themes of hope and enduring suffering with faith was inspiring to her, and that his message and witness could be a great example for everyone. Scot commented that Kevin’s story is very much what a “Good Catholic Life” is about – not every day is bliss, but we persevere with help from God. 2nd segment: Scot welcomed Kevin Wells to the show, and asked him to detail what happened on January 2nd, 2009. Kevin explained that it was a typical night when he was 41, but as soon as he put his head down to go to sleep, it felt like someone had put a tomahawk into the back of his head. A line of arteries and veins had burst in his brain, and his brain was bleeding. By the grace of God he didn’t die instantly, as many people with similar bursts do. Kevin said he remembers the EMTs picking him up gently and walking him to the ambulance – the thought that he might not recover crossed his mind then. After undergoing emergency surgery, he spent a long time in the intensive care unit in the hospital. Kevin continued and said that he was mostly lucid after the surgery, as the main impairment was balance and motor function. He remembers vividly a horrid set of hallucinations of demons taunting him and even of his daughter drowning in the ceiling. Kevin said he had just gotten back from a Jesuit retreat, and had been a regular attendee. He said the Ignatian contemplation helped him battle through the time in the hospital bed. He said the method he followed was to take a scripture passage and continually visualize and meditate on being present in the passage. Kevin explained that the passage he focused on most was being in the upper room and picturing Jesus wash the feet of his Apostles. The tenderness and care with which Jesus did this, even when he was about to die, was comforting to Kevin. Another mental picture of Jesus’ hand on his head helped Kevin offer up the pain and suffering he was going through. Jen said she was struck by the part of the book where he described these exercises, and what a remarkable gift it is that Kevin has good memory and can put this faith into words to share with everyone else. Jen commented that reading through the book it is obvious a miracle happened in his life. Kevin agreed, saying there’s no formula for everyone to deal with pain – we must simply place ourselves in Christ’s hands in hopeful surrender and know he will tend to our needs. Kevin said when we unite our pain with Jesus, God’s graces flow strongly. Jen mentioned that Kevin wrote in the book that sometimes he struggled to feel God’s presence, but that he also wrote in retrospect that “…I’d would be back to my old self in a year or so, yet that really wasn’t the point, it would have been a shame if it was.” Kevin commented that he thinks it’s false theology to say we shouldn’t suffer – Easter wouldn’t have happened without the Cross a few days prior. We need to embrace the Catholic view of suffering, Kevin said – pain is part of life, and all we can do is call on God in a childlike way and ask Him to hold on to us. Scot commented that sometimes when we get so busy, we miss God getting our attention – sometimes an encounter that sets us back or a door that gets slammed in our face can be God’s way of telling us to slow down and listen to Him. Those moments of suffering can help us redirect ourselves through God’s grace, Scot said, and we know that through the testimony of the saints and modern-day situations like Kevin’s. Kevin agreed – God doesn’t send us suffering for His amusement or to torture us, but rather to serve monumental purpose in our lives. 3rd segment: Scot said he was struck throughout the book by Kevin’s relationship with his uncle, Monsignor Tom Wells (known throughout the book simply as “Tommy”). Kevin explained that Tommy was a massive presence in the area, had more friends than anyone else he know, and that the Cardinal would shift from parish to parish because he know Tommy could fix any problem. Kevin said Tommy was a happy ambassador of spreading the Catholic faith. Then tragedy struck – a man walked into Tommy’s rectory on an evening in 2000, and stabbed him to death. Defense attorneys tried to defame Tommy by saying that the murderer had an inappropriate relationship with Monsignor Wells. Kevin said that they all knew that they had to put the anguish and shock into God’s hands. Jen mentioned a portion of the book said that the family decided to gather as a group and pray the rosary at the courthouse. Kevin said that they invited the murderer’s family, and said a rosary with his mother at one point – they refused to turn angry. The murderer was sentenced to 42 years at the end of the trial. Scot asked Kevin to describe a powerful story from the book where Tommy helped Kevin and his wife through their problems with infertility. Originally, Kevin’s wife wanted to use IVF, in opposition to Catholic teaching. They went to meet with Tommy, who told them that they had to embrace the cross of infertility, unite the pain to Jesus’ suffering, and they would find peace. Kevin said their lives were changed – his wife understood that she needed to give it up to God and Kevin understood his wife’s pain. The meeting was only two days before his murder – his last weekly column in his parish bulletin, published just after the murder, was on the cross of infertility. It was a final gift to Kevin and his wife from Tommy, and showed them that God would be their strength throughout the adoption process. 4th segment: Scot mentioned that one thing in the book that moved him was the description of the sacrificial love of the birth mothers of their three adopted children. Kevin agreed, and said it was a pain but a beautiful pain that results in a new life. Each time they went to adopt, Kevin would see the birth mothers hand their child to his wife – the tears are uncontrollable on both sides. Kevin said he knows for a fact that each of the birth mothers, after the heroic act of offering their child up for adoption, there is a peace that God gives them. Scot wrapped up the show by asking Kevin how he is doing – Kevin said he has a relatively clean bill of health and, while he does have some occasional balance problems, God has been good to him. He has been back to work and writing for 2 years now, and things are back to normal. Scot asked Kevin to share what he tells people when they contact him about their own suffering – Kevin said he recommends prayer, reflection, and more prayer. A lot of people have seen that graces can be revealed in darkness, he continued, and that graces are hidden where we least expect them sometimes.